After the success of last year’s event, Soma Skool is back on Saturday Easter Bank Holiday April 20th in Glasgow’s SWG3 complex. The aim is to enlighten, educate and inspire the minds of tomorrow in how to achieve a career in the electronic music industry. This year’s roster of participants is set to be even bigger and better – with more rooms, demonstrations and insider knowledge from the most exciting established artists and brands from across the globe. The full day event will feature panels focussing on: Record Labels, Promoters, Importance of Queer Artists in Electronic Music, Radio Shows, Clubs and a curated panel from Red Bull Music. Joining the Radio Show panel will be Stuart McMillan, one half of Glaswegian duo Slam and Soma Records co-founder whose weekly techno broadcast Slam Radio is one of the genre’s leading entities which showcases not only their own mixes but also focuses on emerging and up and coming talent; Amy Krawczyk from non-profit freeform radio station, arts collective and events promoter Subcity Radio, based at the University of Glasgow, Michelle Harkness from Groove City Radio, an internet dance radio station based in the heart of Glasgow; and Leon from Bristol based Noods Radio. Hosting this panel will be Dougal Permian Executive Chair from the Scottish Music Industry Association who will guide the discussion on how important is live radio in today’s scene and the evolution of radio to podcasts among further topics. For Record Label Panel this year will be: Young Marco representing his labelSafe Trip Records, who is a staple in the incredible Dismantle Festival and part of the fabric of the Amsterdam music scene; Correspondent label head and DJ & producer Jennifer Cardini who has been carving out an impressive career for herself across the globe over the last two decades; Perth based electronic label Craigie Knowes made up of duo Max Spittal & Mitch Hunterand Darren Quail who is part of the A & R team for Soma Records. Hosting this panel will be Becky Marshall from the BBC and So Low Records who will take people through the record label journey from their DIY ethos to becoming internationally known. The Importance of Queer Artists in Electronic Music panel will showcase discussions with trailblazers in the Scottish scene and beyond about their experiences in the industry, career advice and more. Panellists will be John Baillie from slick R&B Glasgow duo Bossy Love, Night School Records, DJ and promoter Jumeau from Brighton and Anna Gram from Glasgow’s most exciting new DJ duo, Lezzer Quest. The panel will be hosted by diversity campaigner and student journalist Marco Marcelline. On the Promoters panel will be Dave Clarke from Slam Events, Riverside Festival & Maximum Pressure, Suzanne Bonner from Shoot Your Shot, Alice Woods from Meat Free , Jack Walsh from Dimensions Festival and Barrington Reeves from Magic City. Hosted by Claire Francis, this will delve into the ethos of events, building a crowd, creating safe spaces and relationships with clubs and artists. And joining the Clubs panel will be Mike Grieve from Sub Club, Grahame Ward from La Cheetah, Saoirse O’Leary from Oval Space and Lutz Leichsenring from the Berlin Club Commission. This discussion, hosted by Chris Finke aka Bodyjack, will focus on the importance of clubs in city culture, the struggle that clubs are currently facing with councils and licensing laws and what can be done to ensure that clubs stop shutting down. Red Bull Music have curated a panel with some of the brightest electronic stars of today, including New York based Veronica Vasicka, Afrodeutsche,Machine Woman, Breakwave. The panel will be discussing what no rules and no boundaries means in today’s electronic music scene. There will be masterclasses from Ableton with British born Ghanaian / Russian / German composer, producer and DJ Afrodeutsche; Glaswegian party starters illyus & Barrientos and Brain Dancing. The classes are organised by Glasgow’s premier Ableton production school, Shoogle Studios. Pioneer DJ and SKapade will take over the Poetry Club with a wide array of DJ and equipment for music lovers to try out. Ahead of his live gig later the same day at Maximum Pressure, KiNK, one of dance music’s best loved live acts will be also be joining for a live DJS-1000 + Toraiz AS-1 demonstration, it’s definitely one to be there for. Maximum Pressure resident and Acid Flash party runner IDA will also be on hand to showcase the DJ skills she has honed throughout the years playing at some of the most exciting parties around. In the Acid Bar Scotland’s premiere electronic music store Rubadub will be hosting an introduction to modular synthesis class, with music mixing industry leaders Allen & Heath also showcasing a number of their new products. In the Photography Studio a VJ workshop will be conducted by local Glaswegian VJ Georgina Penstkart, who will be teaching students how to create live visuals, and giving them hands on experience with equipment. For those wishing to get into the world of music journalism there will be a specialist workshop. This will be held by both Marcus Barnes; who has been writing professionally for 13 years for a variety of publications including i-D Magazine, Time Out & many more and Claire Francis, ex-deputy clubs editor of The Skinny and regular contributor for Mixmag and Resident Advisor. 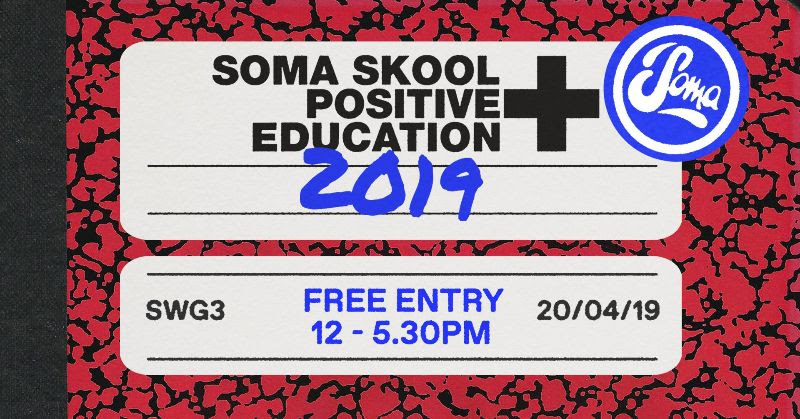 With a stellar line-up already confirmed to participate and the biggest event of its kind in Scotland, Soma Skool is definitely not to be missed for any budding musical entrepreneurs. Soma Skool will be followed by Maximum Pressure Easter 2019 with Len Faki, Laurent Garnier & many more later that day with the party getting started at 6pm. A drugged up dinner ends in a mess..